Leaks of hangouts 4.0 were floating around on internet since two months and the excitement was building up strongly. And now google is finally starting to roll out HANGOUTS 4.0 on android devices. • Hangouts is sleeker. Now updated with material design, Hangouts has a new look and feel: items respond to your touch in more intuitive ways and transitions between tasks are more fluid. • Hangouts is simpler. The new Compose button makes it easier for you to start a new group or conversation. Our streamlined contacts list helps you find the right person quickly. And attachments have been revamped and simplified, so sharing—of emoji, GIFs, your location, even multiple photos at once—is a snap. • Hangouts is faster. Whether you’re sending a quick message or video chatting with family, you don’t want hold-ups. We’ve been obsessively fixing bugs and speeding up message delivery to make Hangouts faster and more reliable. Bonus: less battery consumption. Google is also bringing back Custom status messages. Just say, “Ok Google, send a Hangouts message,” into your android wear watch, and hangouts will deliver. How you can get Hangouts 4.0 apk android? Before you download apk just check app info and see if you meet requirements or not. 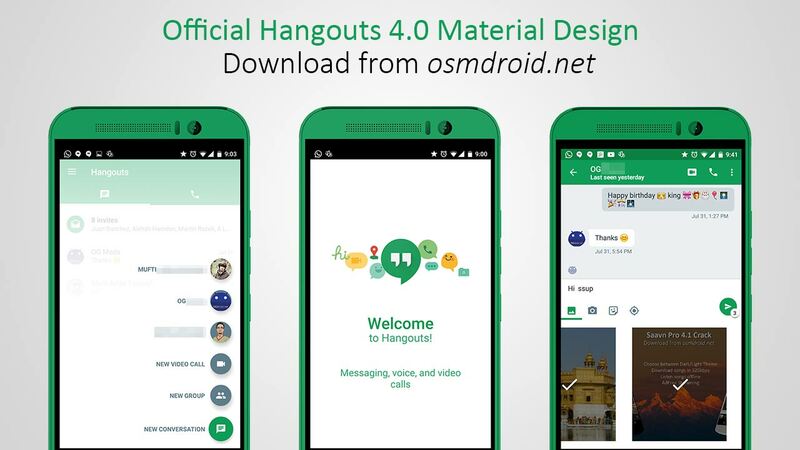 Developed By : Google Inc.
You can download OFFICIAL HANGOUTS 4.0 apk from the download link given below. • Look at that FAB ? Share the post "Google Releases Hangouts 4.0 with Material Design (Finally!)"